LAS VEGAS: The Las Vegas 51s professional baseball team announced today that the Toronto Blue Jays have extended the Player Development Contract (PDC) with the club for two seasons (2011-12). Las Vegas just concluded its second season as the Triple-A affiliate of the Blue Jays and the 28th season overall as a member in the Pacific Coast League (1983-2010). "We're very happy to have the Blue Jays back in Las Vegas," 51s General Manager Don Logan said. "We have a tremendous working relationship with them and we have seen several of their top prospects play in Las Vegas over the past two seasons. "Charlie Wilson (Toronto's Director, Minor League Operations) is the best in the business and we look forward to seeing some of the top players from the 2010 playoff team at Double-A New Hampshire advancing to the Triple-A level in 2011." Over the past two seasons, a total of 28 different players received promotions to the Major Leagues from Triple-A Las Vegas. Top players include: right-handed pitcher Jeremy Accardo, catcher J.P. Arencibia (2010 PCL MVP), left-handed pitcher Brett Cecil, infielder Jarrett Hoffpauir, infielder/outfielder Mike McCoy, left-handed pitcher Brad Mills, left-handed pitcher David Purcey, right-handed pitcher Josh Roenicke, infielder Randy Ruiz (2009 PCL MVP), left-handed pitcher Marc Rzepczynski and outfielder Travis Snider. "We are pleased to continue our relationship with such a strong organization in Las Vegas, Nevada for the 2011 & 2012 seasons," Toronto Assistant General Manager, Player Development Tony LaCava said. "General Manager Don Logan, Manager of Baseball Administration Denise Korach and staff provide a professional environment for our minor league talent to develop." Toronto is a member of the American League's Eastern Division, the toughest division in Major League Baseball. The division rivals include the World Champion New York Yankees, Boston Red Sox, Tampa Bay Rays and Baltimore Orioles. The Blue Jays are the first and only team outside the United States to win a World Series and the first team to win a World Series in Canada. Toronto won back-to-back World Series titles in 1992 and 1993. Las Vegas has compiled an overall record of 137-151 (.476) as the top farm club of the Blue Jays in two seasons. Las Vegas was 71-73 (.493) in 2009 and 66-78 (.458) in 2010. The 51s last appeared in the PCL Playoffs in 2002 (85-59, .590). HISTORY OF PDC'S: The Las Vegas franchise began playing Triple-A baseball in the Silver State in 1983 as the Stars were originally the Triple-A affiliate of the San Diego Padres and captured two PCL Championships in 1986 and 1988. Las Vegas was the Triple-A affiliate of the Padres for 18 seasons (1983-2000). The team changed its nickname in 2001 to the 51s and became the Triple-A affiliate of the Los Angeles Dodgers. The Dodgers spent eight seasons in Las Vegas (2001-08). 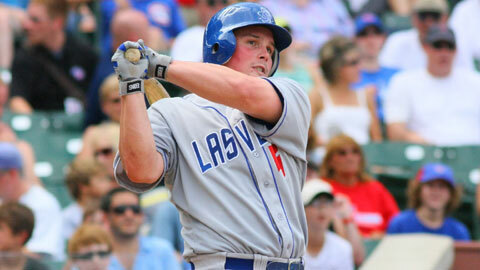 Las Vegas then announced, on Sept. 22, 2008, a two-year PDC with the Blue Jays. Season tickets and mini-plan packages (10, 20, 33-game plans) for the 2011 season are available by calling the 51s office at (702) 798-7825. Official licensed 51s team merchandise is available on the "Team Shop" section of the website at www.LV51.com.